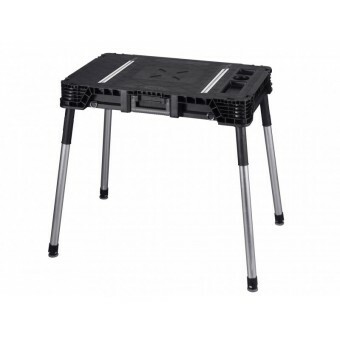 This Work Bench is great for creating a professional work area in any room or job site. Versatile and completely portable, this lightweight work table is designed for professionals on the go. It takes seconds to assemble and has a built-in leg stabiliser, enabling it to hold up to 453kg (1,000lbs) of weight on its surface. Comes with 4 holding clamps and integrated universal metal T-track rails. Large Work Surface - 880mm x 550mm. Lightweight - only 9Kg. Capacity: 453kg (1,000lbs). Comes with a 25 year warranty.